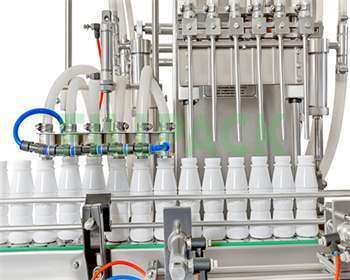 The filling machine will be operated automatic type with 2/4/6/8 heads preferably with diving nozzle type to avoid foaming during filling process. All the working parts of the machine coming in contact with the product are S.S.316 (filling cylinder & nozzle). Conveyor had inlet & outlet ends of the machine variable speed to synchronize with the filling the filling machine speed. The conveyor tailing width adjustable. Filling head height will be adjustable. Main motor 1 HP (Siemens, Hindustan, Bharat Bijlee). Conveyor Motor ½ HP. (Siemens, Hindustan, Bharat Bijlee). The company has a successful leadership track record of two generations of being in the same business of machine manufacturing, which once reckoned from machining job work 30 years back. Since then we have never looked back. Ekveera Laghu-Udyog Sankul, Unit No.14, Road No.25, Wagale Industrial Estate, Thane - 400 604 Maharashtra, India.